Byzantium was founded in 330 when the Roman emperor Constantine had chosen a Greek colony Byzantion to be the new metropolis of the Eastern part of the Roman Empire. In a few years he expanded the city and fortified it heavily. The new metropolis got its name after its founder – Constantinople. Under the rule of Constantine’s sons and grandsons, the Eastern Roman Empire amalgamated with the Western Empire several times, but in 395 emperor Theodosius finally divides the Empire to the Eastern and the Western. The Eastern part was heavily influenced by the Greek, Helenic civilization, and the Western by the Latin.1 „Eventhough Byzantium was aware of its relation to the old Rome, through time it alienated further away from the original Roman foundations. Culturally and linguistically the hellenization and theocratization of the Empire was manifesting further more (during the emperor Heracliu’s reign, the government will have started using Greek language exclusively, and the Greek word basileus will have become the official title of the Byzantine rulers. )“.2 In Byzantium the ruler and the Church were very interwined, and the emperor had also a very high influence on the religion itself. Since emperor Arcadius and his banishment of the patriarch John Chrysostom,3 the Church is subjected to the supreme authority of the emperor. This mosaic resides in the southern portal narthex and they are originated in 990. It is believed that this mosaic was made for the emperor Basil II, who notably admired those two of his great predecessors. 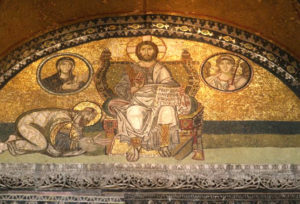 Although it is generally acknowledged this mosaic dates from the 10th century, there are some doubts to this theory.5 The mosaic itself displays Virgin Mary on the throne, with Christ in her lap, holding a pen and a scroll in his hands. They are being approached by the emperor Justinian on their left. Justinian is holding in his hands a model of the church of Hagia Sophia. In the opposite, the emperor Constantine is holding in his hand a miniature model of the city of Constantinople, named after him. They are both offering these sacramential gifts to the Virgin Mary. Format of the mosaic is semicircular, and it also shows an indication of space. Even though its background’s colour is gold, the low part, containing the characters, is green, therefore marking the ground. The heads of all the characters, including the two emperors, are surrounded by aureolas, thereby classifying the emperors themselves divine, or sacred. 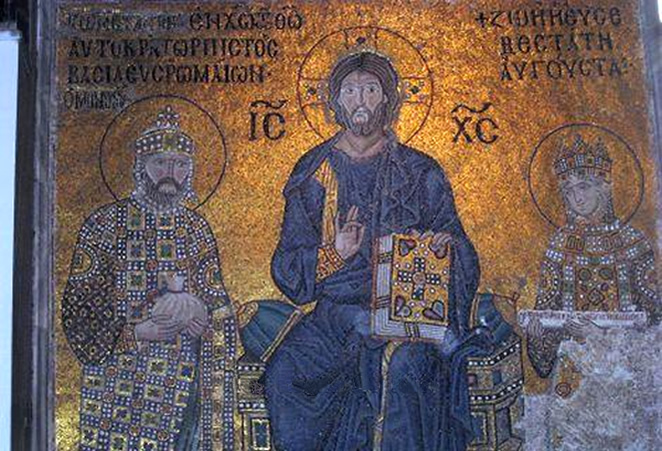 The mosaic is realized particularly meticulously, with numerous details on the emperor’s outfits and crowns. Next to them are different inscriptions celebrating their rulership.“This mosaic is not just a mere artistic expression of a certain theme, but it shows a distinct relation of the Church and the Empire with God, who bestows his blessings to the church, the ruler and the state.“.6 Remarking glorious ancestors, and the setup of the Empire’s capital city, and its primary church, signifies the reconstruction of the city and the entire Empire under Basil II. The mosaic resides in the eastern wall of the southern gallery. By style, it is very similar to the prior, also residing in the southern gallery. The central figure is Virgin Mary in a blue maphorion holding the baby Christ in her arms. 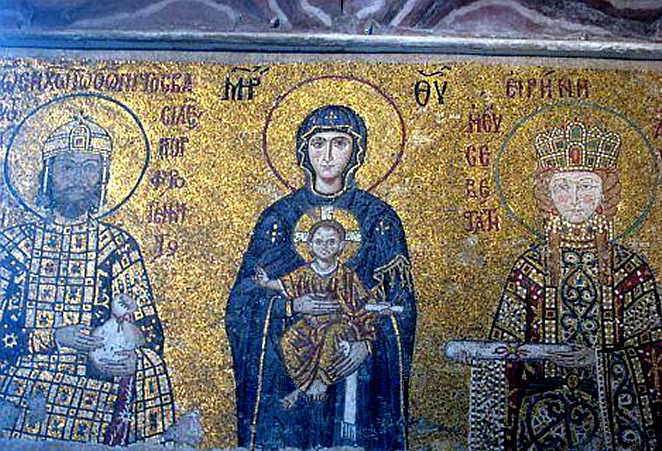 Emperor John II Komnenos and empress Irene are dressed luxuriously, wearing crowns on their heads, and holding the same objects as Constantine and Zoe in their hands. The emperor carries a sack of gold, and the empress a scroll. Virgin Mary’s lips are flat, the same as Christ’s, and their cheeks are convex and modelled rather traditionally, just like on the three characters in the previous mosaic. The Christ’s expression is somewhat ominous (as in grown-up, instead of a child), which contrasts to Virgin Mary’s equanimity. The portraits are more precise here then in the image of Constantine and Zoe, probably as a result of a subsequent restoration. John Komnenos is displayed showing expressive personality, whilst the empress, whose beauty was written about even at their time,10 is presented here in a slightly more conventional manner. By familiarizing with the style, the iconography and the setting of these mosaics, one can assume some conclusions on their significance. First of all, it is important to notice the role and the position of a byzantine emperor, basileus. Along with the civil government, he had large authorities regarding the issues of the Church (i.e. the iconoclastic period was started and ended by the emperors). In artistic displays, emperors and empresses, apart from the attributes of their profane government and luxurious clothes with pearls and gemstones, have also had aureolas. By this, they have been charactered as saintly or divine. On most of mosaics represented here, emperors and empresses are displayed together with Virgin Mary or Christ. Still, they are not displayed as equals, instead the emperors are bearing gifts or bowing to the Christ and Virgin Mary. This infers that these are all sacramential mosaics. Their purpose can especially be seen by the attributes held by the empresses (i.e. Zoe or Irene), and that is the scroll with a list of imperial endowments. On the other hand, the emperor carries a sack of gold. We can conclude from this that, with these gifts to the Church in this world, they were trying to secure a better place for them in the next one. 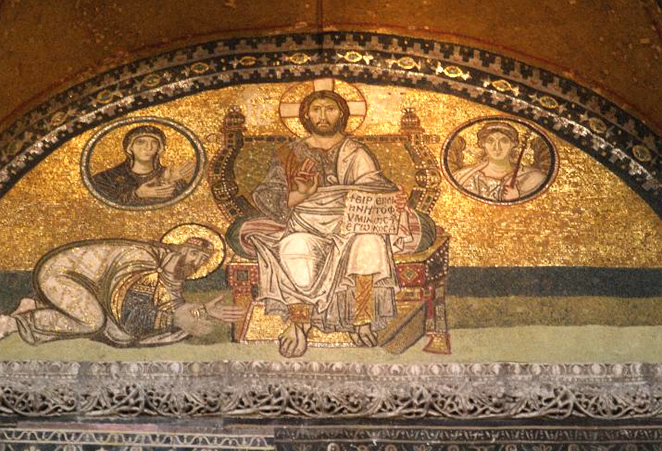 And to make a bigger point, they created these sacramental mosaics in the main church of Constantinople – the Hagia Sophia. With this they were setting an example for the common people, and by showing their act emphasizing their generosity and humility before God. On the other hand, this way they are showing to the little man, passing by these mosaics, of their generosity and true religious life, therefore encouraging him to follow his emperor’s example. Naturally, this way the image of the emperor is preserved on the walls of the court’s church, for the next generations to remember him, as a good and righteous ruler. ANDRE GRABAR, Vizantija, Vizantijska umetnost srednjega veka (od VIII do XV veka), Novi Sad, 1969. CHARLES RUFUS MOREY, The Mosaics of Hagia Sophia, The Metropolitan Museum of Art Bulletin, New Series, Vol. 2, No. 7, str. 201.-210., 1944. CHRISTA SCHUG-WILLE, Bizant i njegov svijet, Otokar Keršovani, Rijeka, 1970. ANIA SKLIAR, Bizant, Extrade, Rijeka, 2005. 1 (ed.) MELITA TOMAŠEVIĆ, Povijest svijeta, Split, 2005., 333. 2 „Premda je Bizant bio svjestan svoje veze sa starim Rimom, tijekom vremena sve se više udaljavao od prvotnih rimskih osnova. U kulturi i u jeziku sve se jače očitovala helenizacija Carstva i njegova teokratizacija (od vremena cara Heraklija i vlada će se početi služiti isključivo grčkim jezikom, a grčki naziv basileus postat će službeni naziv bizantskih vladara. )“ (ed.) MELITA TOMAŠEVIĆ (note 1), 333. 3 Opširnije u (ed.) MELITA TOMAŠEVIĆ (note 1), 333. 4 CHRISTA SCHUG-WILLE, Bizant i njegov svijet, Otokar Keršovani, Rijeka, 1970., 164. 5 First of all, because the mosaic looks is difficult to accept as style from the late tenth century. Figures of strong volumes were placed in an area that does not appear in Byzantine art of this period. 6 „Ovaj mozaik nije samo puki likovni prikaz zadane teme nego pokazuje jasnu povezanost Crkve i države s Bogom koji blagoslivlja crkvu, vladara i državu (grad).“ MILUTIN GARČEVIĆ, Mozaik, Zagreb, 2006., 160. 7 CHRISTA SCHUG-WILLE (note 4), 164. 8 CHRISTA SCHUG-WILLE (note 4), 164. 9 CHARLES RUFUS MOREY, The Mosaics of Hagia Sophia, The Metropolitan Museum of Art Bulletin, New Series, Vol. 2, No. 7 (Mar., 1944. ), 204. 10 CHARLES RUFUS MOREY (note 9), 205. 11 CHARLES RUFUS MOREY (note 9), 205. 12 CHARLES RUFUS MOREY (note 9), 205. 13 CHARLES RUFUS MOREY (note 9), 207. 14 CHARLES RUFUS MOREY (note 9), 206. 15 CHARLES RUFUS MOREY (note 9), 207.